I thought this quilt block, Fox and Geese was looking familiar. Perhaps I am missing something, but it looks just the same as Old Maid's Puzzle to me. I guess it is one of those quilt blocks that goes by many names. 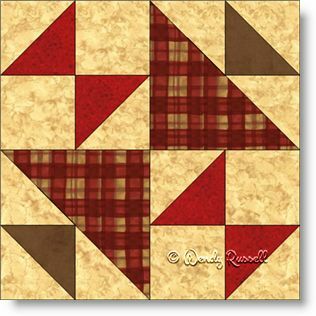 This block is a simple four patch comprised of only squares and half square triangles, so this is a good choice for a beginner quilter. Both of the sample quilts illustrated are created using four blocks together, and using 90 degree rotations of each of those four blocks to make one large quilt block. This produces a secondary pattern and two unique quilts.